ArchTec Series Parkview Trash Receptacles offer a positive impact that help improve litter management programs. The 45 gallon capacity receptacle is manufactured with commercial grade steel, designed with vertical slat style base accented by sleek horizontal bands. 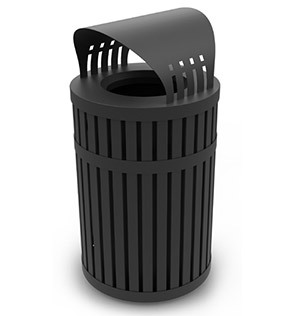 ►Need an Archtec Trash Receptacle Fast? With a choice flat or canopy lid that securely connects onto the receptacle and features a discrete lid to base cable attachment. Removable black powder-coated liner is included with built-in handles and bag clips to eliminate unwanted bag slippages. 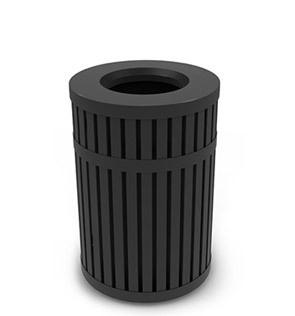 The receptacle base is configured with four 3/4" rubber feet to help maintain stability on uneven surfaces. To ensure top performance, structural integrity and visual appeal, ArchTec Parkview Trash Receptacles are sealed in a corrosion resistant, weather-proof powder-coated finish.